Skylights - ADRIFT, ALAN, What Note? @jue There you go. I haven’t added it on GitHub as it should be in the plugin manager soon. After being a musician, an artist, a composer und a producer over the years the next step to a developer is very hard for me! And thank you for these modules! for me the Vactrol Mix Expander shows some strange behavior on mac. Most of the time it works prefect but some times it starts producing noises like I would feed it with some low drum or gate signals, While this is the case even disconnect the inputs does not stop the noises. Have no idea what is going on. You have to close rack and start again. Some times this behavior comes when I save the rack file or doing something in a different window of the finder. The problem is only coming when Vactrol is in the patch aside the ALAN module. It does not happen consistently, sometimes the patch is working without problems. Have several patches were the same problem occurs. Combinations ALAN with Volts and/or Pulses only are working like a charm. Yep. Was a memory bug. Have a fix coming in the next release. till now no more problems with the Vactrol module, thank you! Recorder has inched along a bit. Originally meant to look like a digital recorder, seeing videos of casette tapes and general sentiment that modules should be pretty changed my mind. It will still just dump out wav files of its input, but instead of all kinds of meters and what not will just look like a casette tape spinning while it records. Fun nostalgia. The Adrift panel, showing a single big knob to control the total amount of randomness in the system and six channels that apply up to this amount of randomness. Each channel has an independent random value added to the input signal, but the intensity of this value is controlled by turbulence. Sails are processed before the input->output chain, so you can use the retrigger or gate of a note to apply minor pitch changes to each one. The Bip switch sets whether noise is added to a unipolar or bipolar signal; bi-polar signals may also add negative noise. 0.6.4 has been merged and pushed to Github, along with some new documentation. 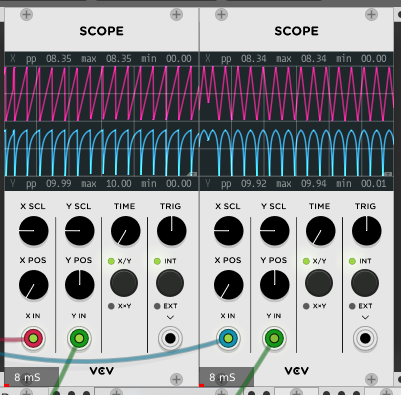 0.6.5 has been published; it integrates an anti-pop system to the Vactrol mix expander. Pluginmanager still says 0.6.3? Is there any Problem? Looking for a manual Mac build, please! I think the people who handle approvals are just really busy as of late. Man, those are awesome! Thank you! Do you think we see V1.0 first? A module to run arbitrary CVs through a “slow” vactrol chip.